Mimsy: Nathan Fletcher, desperate politician? Is it a disservice to taxpayers show governments how to provide better and more efficient service? Assemblyman Nathan Fletcher is flooding my mailbox with bad ads; he’s coming across as a typical dishonest beltway1 politician. He’s just making stuff up and throwing it at the mailbox to see if it sticks. Over the last five days I’ve received three large advertisements from his campaign misrepresenting Councilman Carl DeMaio’s record. 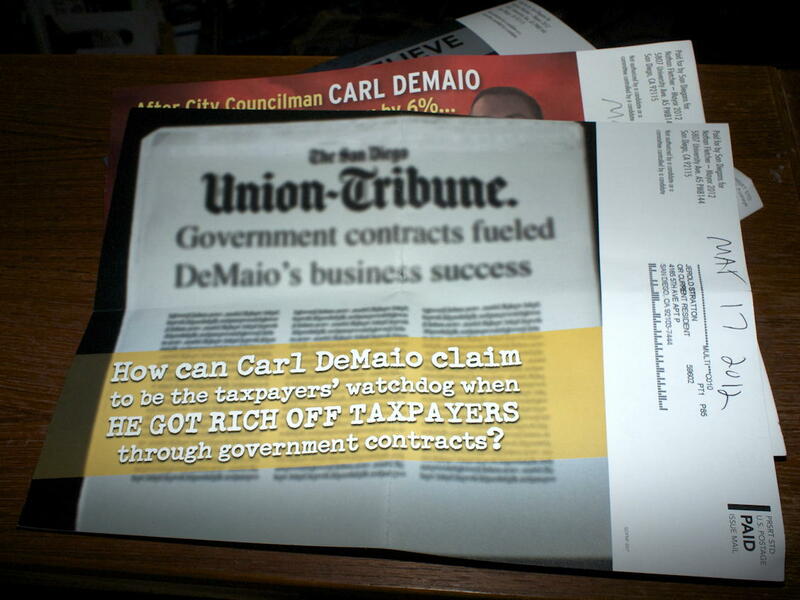 How can Carl DeMaio claim to be the taxpayers’ watchdog when HE GOT RICH OFF TAXPAYERS through government contracts? Well, off the top of my head, what if his contracts were to show public officials how to spend less of our taxes and provide better service? Does teaching public officials how to not raise taxes count as being a taxpayer watchdog? Why yes, I think it does. The political career of City Councilman Carl DeMaio has been built on his reputation as a successful businessman who knows what it takes to make governments run better. Fletcher’s yellow screamer would be a lot more accurate and a lot less useful to Fletcher if it included the full context of that article. May 22, 2012: Ask Carl This? The mayoral campaign is really heating up. Assemblyman Fletcher now has a web site, AskCarlThis, that pretends Carl DeMaio isn’t answering questions. It’s headlined “Carl won’t answer the questions”, but you can go straight to DeMaio’s web site to see the direct answers to most, if not all, of them. The most ridiculous is the charge that DeMaio attempted to “defund the ethics commission”. Fletcher is exhibiting the typical beltway mentality here: any attempt to cut costs on a project is morally equivalent to shutting the project down. From 2006 to 2008, the commission’s budget increased dramatically, by over 34%. The cost savings I proposed for the Ethics Commission budget of $307,000 was actually significantly less than the $350,000 budget increase during that two-year period. The reductions were geared towards a secondary ‘education and outreach’ function of the commission’s budget, not its primary enforcement operation. As a comparison, this reduction was less than half of what I recommend for the City Council and it’s administrative ($669,400). Over two years, it increased by $350,000; DeMaio’s proposed budget wouldn’t even have rolled it back two years. If we can’t reduce budgets without being accused of completely withdrawing support, we will never get our budget in line without continually raising taxes. This is part of what got California—and DC—into its current mess: basing every budget on the previous year’s budget, and calling any attempt to cut budgets as sacrilege. That needs to change, and it sounds like DeMaio is trying to change it. Yes, I know, that’s DC. Work with me here, I’m on a roll. Besides blurring it out, I’m pretty sure he replaced the entire article with boilerplate, just to make sure the ad didn’t provide even subliminal context. The length of the blurred out words don’t seem to match up with the text of the Union-Trib article. The three columns of blurred-out text don’t even appear to have any paragraph breaks. Similar concerns from other politicians are probably behind Proposition 28, which increases the number of years a politician can remain in the state assembly from six years to twelve years, and the number of years a politician can remain the state senate from eight years to twelve years. If you’re getting campaign ads about “questions Carl won’t answer”, you should go to his web site. Chances are, Carl Did Answer. Yeah, the San Diego mayor’s election is heating up. “We just can’t afford hypocrite politicians like Carl DeMaio.” says Assemblyman Nathan Fletcher’s campaign. Bonnie Dumanis or Carl DeMaio? Two of San Diego’s mayoral candidates are running on a platform of fiscal sanity. Which is the best choice for 2012? Carl DeMaio connects with voters in secret community coffee in the Mission Hills/Hillcrest neighborhood. Looking very calm, very dignified, with his legs in the air, came Eeyore from beneath the bridge. “Eeyore, what are you doing there?” said Rabbit. Nathan Fletcher, desperate politician? last modified May 22nd, 2012.